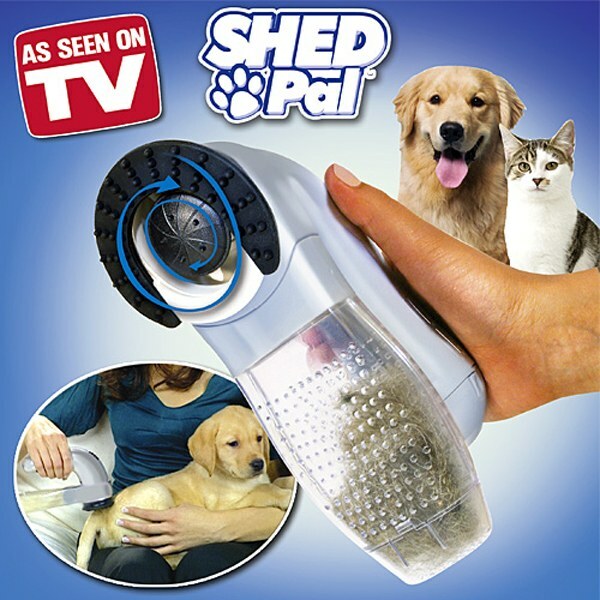 Shed Pal As Seen On TV is the incredible cordless pet vac that vacuums to collect pet hair while you groom. Shed Pal as seen on TV! Incredible cordless pet vac that vacuums to collect pet hair while you groom. The mess free way to control shedding. Clean up pet hair, before it gets everywhere! Shed Pal is the easy to use pet preferred grooming system with massaging nubs and gentle suction that removes shedding fur that allows you to groom your dog or cat easier than ever. There is no harsh wire bristles, no snagging or pulling and no fur flying mess. It works perfectly on short or long haired pets, allowing you to keep your furry friend looking neat and clean. Fast, easy and gentle, and features a hair collection canister. Long haired, short haired or curly haired, your pet will love the massaging action. Battery powered- requires 3 x AA batteries not included. I was so excited to receive my Shed Pal!!! Rushed around to get batteries in it!!! Did NOT work!!!!! Tried another set of batteries,,, DID NOT WORK!!!!! Bought new batteries,,, STILL DID NOT WORK !!!!!! I am so disappointed!!!! My dog sheds soooo bad,, couldn&apos;t wait for this!!!!! What a let down!!!! I love it, my puggle wags his tail and comes over when he sees me getting it out. Best thing ever!